Different World [TAORMINA.ME] took almost six months to formally appear; it was originally announced in April 2006 with the single being released the following November. Conceived as a remix single to be released in Germany and Italy, Mousse T and So Phat! were first commissioned for remixes in April. An extremely limited one track promo was released in May, but only featured the album version of the track. It was quickly snapped up by collectors and remains quite rare. In July, further remixes were commissioned by Absolutely Records with The Beat Thiefs, DJ Moussa Clarke and Matteo ESSE & Sant reworking the title track. By October, an in-house listening copy from Absolutely included DJ Moussa Clarke, Matteo ESSE & Sant, two mixes by Phunk Investigation, Scumfrog, The Beat Thiefs and Benny & Paolo Ursin. At this point Absolutely Records were waiting for clearance from Sanctuary Records. The plan was to release two 12" singles and a CD. The first 12" appeared in November, and included remixes by Scumfrog, Benny & P Ursin vs Phunk Investigation, DJ Moussa Clarke and Phunk Investigation. It was released in Italy, and distributed through various DJ outlets as an import. 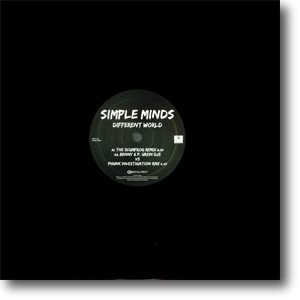 After a wait of two months, a download release included the four remixes from the 12" plus four exclusive new remixes. These included the remixes from the listening copy plus the new Tali Freaks Remix . In April 2007, the second 12" was issued. Many expected it to feature the remixes made available on download, but fans were surprised again: this 12" featured the two So Phat! remixes originally commissioned the year before. An ultra-rare two-track CD promo was also distributed. Fabrique started work on a sleeve, wanting to create a brand new image (rather than one based on the album artwork or booklet). In the end, it was never really started.